Take a gander at the Omnivore Recordings website and you’ll find plenty of examples of how the archival label has spun gold out of long-lost recordings by rockers like Big Star, Bash & Pop, and Game Theory as well as singer-songwriters like Peter Case, Linda Perhacs, and Tim Buckley, among many others. So it would seem that Omnivore’s recent acquisition of the back catalogs of soul label Ru-Jac Records and reggae imprint Nighthawk Records is a bit out of their comfort zone. Given the past commitment to excellence shown by the label for its archive releases, I’m willing to provide Omnivore with the benefit of the doubt. The initial releases from Omnivore’s acquisition of Nighthawk Records will include the Gladiators’ 1995 album Full Time and the previously-unreleased The Return of Jack Sparrow by Ethiopian & His All Stars. Both albums will be released on December 15, 2017. Nighthawk Records was founded in St. Louis in 1976 and originally released several acclaimed post-WWII blues compilations. The label changed gears to focus on reggae by 1980 and would release albums by reggae legends like the Itals, Gladiators (and their singer Albert Griffiths), Justin Hinds, and others, before closing up shop in the ‘90s. Gladiators’ Full Time is an excellent twelve-song compilation of session outtakes from the band’s handful of albums for Nighthawk, remastered from the original master tapes. We can only hope that Omnivore chooses to reissue Nighthawk’s 1980 compilation album Wiser Dread, an incredible sampler of some of Jamaica’s best music. The Nighthawk catalog releases will be co-produced by Omnivore’s Grammy® Award-winning producer Cheryl Pawelski and Nighthawk co-founder Leroy Jodie Pierson, who will also provide updated liner notes and rare photos for the reissues. On January 19, 2018 Omnivore will release Something Got a Hold on Me: The Ru-Jac Records Story Vol. 1, 1963-1964 and Get Right: The Ru-Jac Records Story Volume 2, 1964-1966. The former album features 28 tracks, 10 of them previously-unreleased, including performances by Winfield Parker, Flattop Bobby & the Soul Twisters, Brenda Jones, Jolly Jax, and Jessie Crawford while the latter album offers 22 tracks, eight of them unreleased, including singles by Brenda Jones, Shirley of the Soul Sisters & Brother, Harold Holt, The Mask Man & The Cap-Tans, and Bobby Sax & His House Keepers, as well as newly-discovered demos by soul giant Arthur Conley. Subsequent volumes of the Ru-Jac Records story will be released on February 2, 2018. 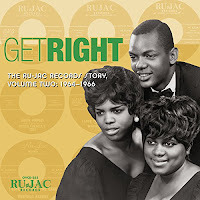 Founded in 1963 by Baltimore promoter Rufus Mitchell and his partner Jack Bennett, Ru-Jac Records primarily released regional soul and R&B singles from ’63 through the mid-‘70s. Omnivore has already enjoyed success with previous releases by two of Ru-Jac’s brightest stars, Winfield Parker and the duo of Gene & Eddie. Parker will help oversee production of the Ru-Jac albums, which are co-produced by Pawelski and soul music historian Kevin Coombe, who also provides liner note for the releases, which will also feature rare photos.